Vega Sicilia produces this 2008 Vega Sicilia Único ($387.15), a red wine from the region of Ribera del Duero vinified with tempranillo and cabernet sauvignon from 2008 and has an alcoholic content of 14,5%. The 2008 Vega Sicilia Único is the ideal red to combine with foie and bar-b-q. 4 of 5 points is the average score of this red according to Uvinum users and has also robert parker: 96. A unique wine like this one does not require an introduction, because it has successfully overcome all limitations to becoming a worldwide symbol. Vega Sicilia Único 2008 assembles to perfection the qualities of tempranillo and cabernet sauvignon. After unique processes of winemaking and aging (it is probably one of the wines with the longest aging of the world, as it can spend almost 10 years between wood and bottle), it becomes a wine of inimitable character and style: elegant, complex, with a huge capacity to evolve. All of this has catapulted Único to the Olympus of wines and has turned it into a legend. - Nose: toasty aromas of wood, notes oxidative countersunk evolution. - Mouth: great range of flavors of wood aged but clean, with dry and pleasantly bitter tannins oak, a hint of sweetness of alcohol. GRAPES: Cabernet Sauvignon, Tinto Fino. Vega Sicilia Único 2008 is a wine made from grape varieties Tinto Fino and Cabernet Sauvignon. 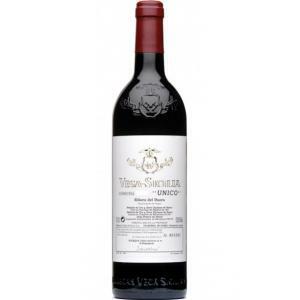 If you want to buy 2008 Vega Sicilia Único, at Uvinum you will find the best prices for Ribera del Duero red wine. Save money with Uvinum, online, safe and with all the guarantees. We offer over 59.000 products on sale which vaults us to the top of the mountain in selling wine, beer, and spirits in Europe with more than 38.000 satisfied customers.